Starbucks is officially ready to run. 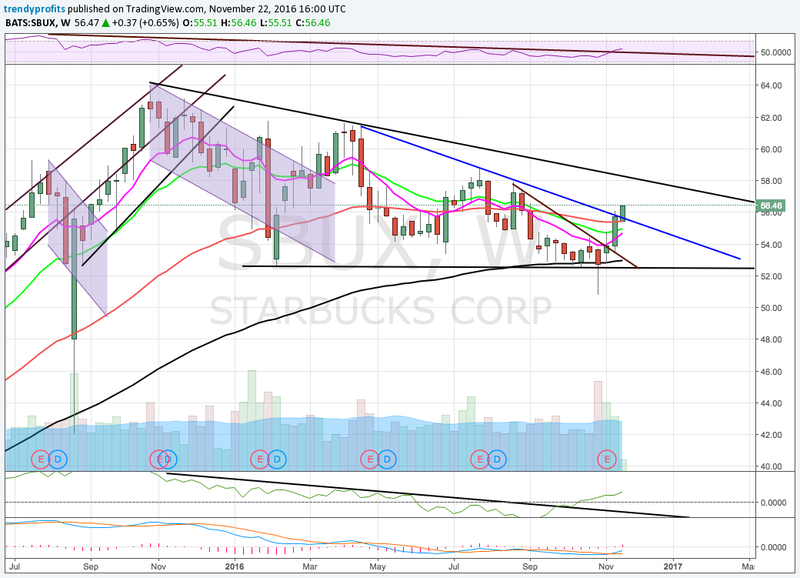 After 1 year and 20 days from reaching its all time high of $64.00, SBUX is ready to surge. Purchased 100 shares today at $56.40, with $0 in trading fees for a total cost basis of $5,640.00. Lets take a deeper look. First and foremost we need to review and see if the trade was made without breaking any of the trading rules. 3) Brand/Product/Company is noticeably 'in style' and changing our culture. NOT A FAD! Beyond this, what really excites me about SBUX is the global growth story. Globally, revenues are growing at 29% in China/Asia. The company also just appointed a CEO to focus specifically on China. 2,042 net new stores were opened over the past 12 months and same store sales grew by 4%. Besides China, Starbucks continues to expand all over the world. They entered their 75th country in Q4 and its 1000th store in Latin America. In Europe, I am not getting caught up in the currency issues. Every company is dealing with the strong dollar, and while this has an effect on the bottom line, the brand is still growing. If there was a dramatic slow down in sales, there would be cause for concern. Overall, I rate this a long term buy for my portfolio. $AAPL is on the move (everybody knows this by now), but that does not mean it is a bad investment. Short term, the stock may pull back as low as $104, but long term I see massive potential. $AAPL just crossed and bounced off of all major weekly support levels with volume. I expect some profit taking in the next 2-3 weeks with the release of the iPhone 7. When this pulls back, I think it will be a bargain. I am a buyer on a pullback around $106. Lets look at the chart below and diagnose a few key areas. 4. Bounced off of the 10 and 20 week moving avg, sustaining the move the following week. 6. STRONG financials and TONS of cash. 1. News cycle- This could make or break the stock in the near term. If the new products do not live up to the medias expectations, expect a near term hit. 2. Uncertainty abroad. So much of AAPLs future relies on China and India. With restrictions on stores in China and problems selling in India, AAPL has an uphill battle. 3. Currency issues and the strong dollar will be a problem if global economies continue to struggle. Overall, I rate AAPL a buy for long term investors. I would wait for a pullback in the $104 range, but even now, it is a bargain. Long term trends in are defined differently socially then they are in the market. 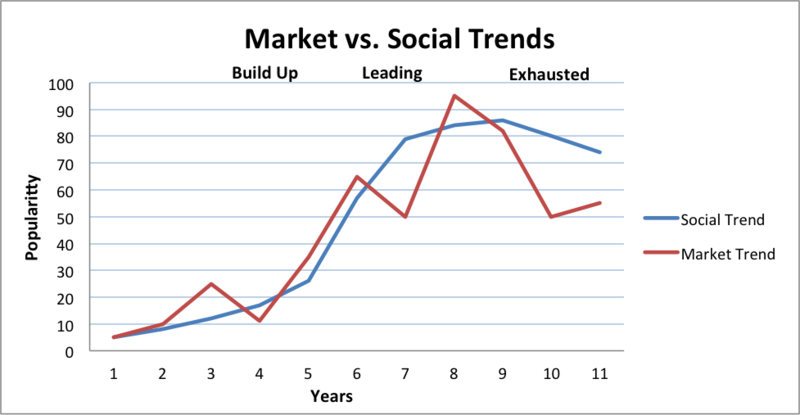 Long term social trends are usually under the surface, and you see them build slowly year after year until it becomes main stream. The trend can last 3-5 years after becoming ‘Mainstream’, but the goal is to catch on before then. Market trends are much shorter, focusing more on short term issues than longer term trends. The market cares more about news headlines; selling off in a panic and surging on better than expected news. A market trend is bumpy, lasting last multiple years, but the path in which it gets there is not as smooth. I believe long term trends are a 9-11 year process broken up into four distinct phases; Infancy, Build Up, Leading, and Exhausted. Infancy (1-2 Years) – This phase is very generational, centered on the younger and most recently graduated. The focus now is on the Millennials. It is important to focus on what they want and what they are doing. An IPO may come out and pop to high gains, but settle. A larger company may see its stock begin a gradual, steady rise. Build Up (3-5 Years) – This has caught on via social media, word of mouth, and has become very noticeable in pop culture. Corporations rush to try and fill the need met by much smaller niche companies. New product lines try to sort out what consumers really want. This is usually accompanied by scattered choppiness in the stock. Leading (6-9 Years) – Most generations are now fully involved in the trend. Companies cater products to mass market. Products are well known and sophisticated. Expect a surge in stock price and continued strength. Exhausted (10-11 years) –It is no longer cool or vogue to be in that trend. Usually by this point, something else has taken over. While you can still make money in these trends, the gains will not be steady enough to justify it. Stock will most likely take a large hit in price. The ultimate goal is to catch the trend in the first 3 years before everyone else does. The big question is, how do we do this? The answer isn’t as hard as it seems…pay attention to what is around you. 2010: Millennials are coming of age, graduating from college and getting into the work force. Obesity issues were running rampant on the news and awareness started to increase. Millennials embraced this news and started eating healthier and living more active lifestyles. Chipotle increased in popularity, McDonalds began losing its lure, and organics started to come on the scene. 2011: Hospitals started to embrace the “Preventative Healthcare” initiative. Yoga pants and athletic apparel were the craze, hitting college campuses and being worn by young people everywhere. Devices like the Fitbit came out and Federal Law now required calorie labeling at restaurants. 2012: It became the trend to wear the brands Athletic line of clothing. The older generation came into social media where people post their athletic accomplishments. Media coverage of the Affordable Care Act is getting men and women of all ages to take a look in the mirror and in their kitchen cabinets. Restaurants roll out more low calorie options, adding low calorie portions of the menu. 2013: Crossfit is all the rage. Older generations are starting to focus on fitness and maintaining their health. Fitness starts to oversaturate the market, and millennials are looking for the next big thing. Preventative healthcare is still being pushed by hospitals. “Clean living” and Paleo diets take the grocery stores by storm. 2014: Technology and fitness finally come together in a seamless way, reeling the Millennials back in for good. GPS watches aren’t overbearing and Fitbits can track everything from sleep to heart rate and calories. Apps on your phone make it easy to track meals and caloric intake. Millennials are having more kids and its “appropriate” to have your child eat at McDonalds. Starbucks comes out with healthier options for their lunch and snack options. 2015: Apple comes out with the Apple Watch and iHealth app. All major grocery stores pack their aisles with organic food and athletic clothing is more popular than regular clothing. It becomes “Cool” to show that you work out and track your fitness goals. Fitness and health is literally everywhere you look. 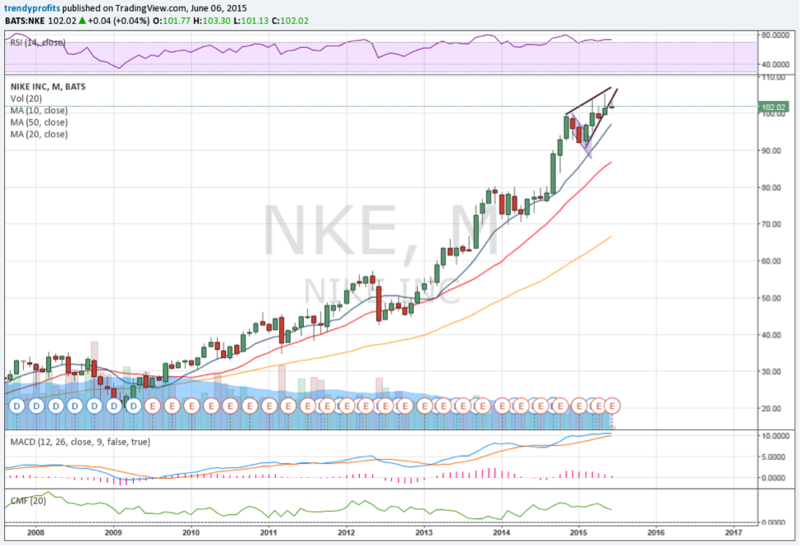 As you can see from the monthly $NKE chart above, the stock goes in and out of favor even though the social trend is building steam. There are many reasons for the up and downs. New apparel companies come out and take share from the company, and it takes time for the company to adjust and regain share. For example, when $LULU lemon hit the scene, they had the loyalty of all yoga pants wearers and it was only cool to have the $LULU logo on them. As $NKE saw this was a longer trend, more emphasis went on yoga pants creating their own look with more colors and designs that nobody else was doing. Overtime it became cool to wear ‘The Swoosh’ again. It is important to note that there are many companies that explode onto the scene, but go in and out of trend much faster. It is important to profit from these big gainers in order to beat the market. Look for more information on this in an upcoming post. With the market swinging pretty violently in both directions this week, we had only one entry ($FB), no exits. It is important to note that one stock, $RH is very close to stopping out. With $RH reporting earnings this upcoming week, I will be watching this one very closely. 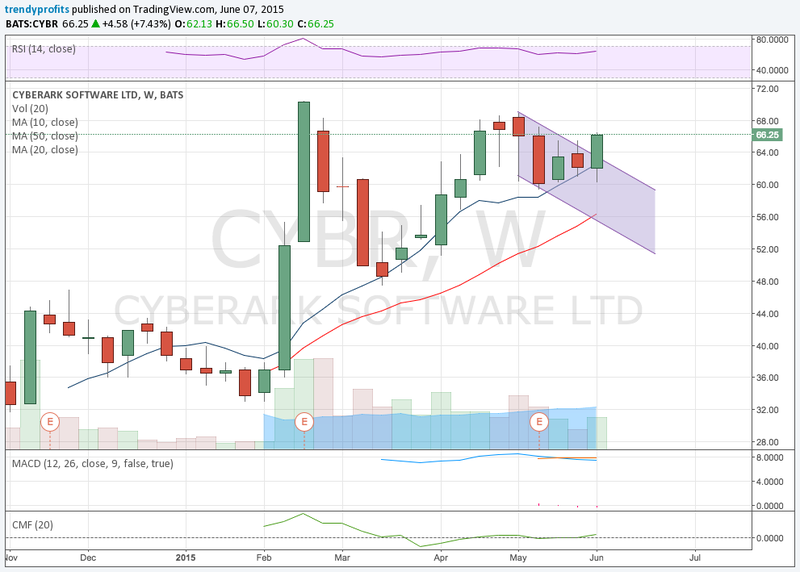 $CYBR – Broke out on weak volume, but a large percentage gainer. I expect the stock to show weakness this week. Waiting for volume to get into the stock. 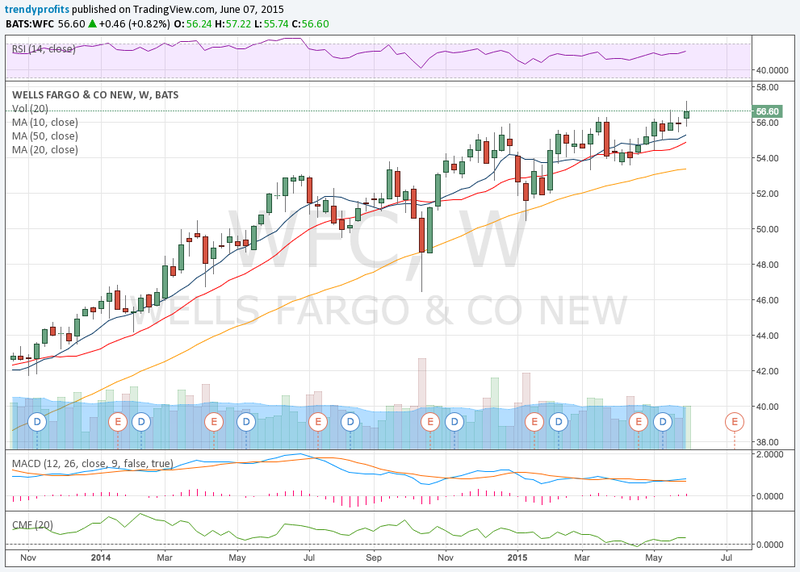 $WFC – Top pick for banking. If interest rates rise, watch for this stock to soar. 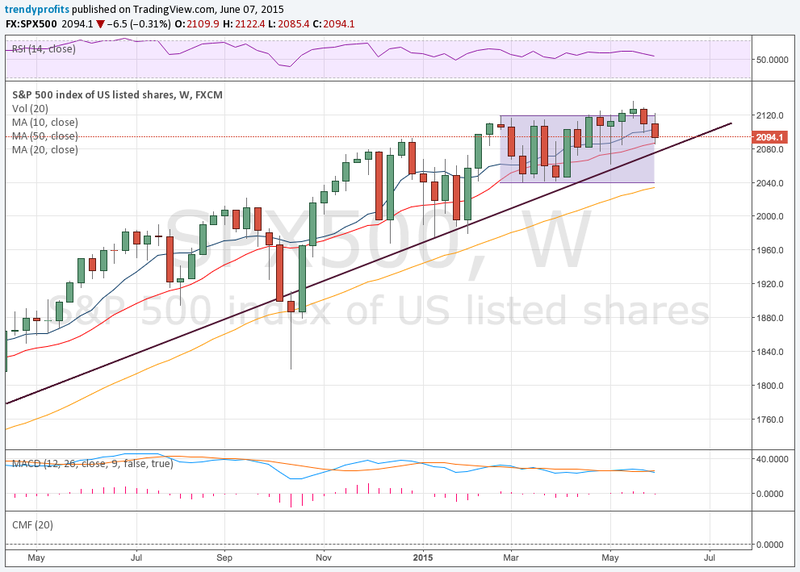 Stock has run up too much to purchase, but waiting for a pullback. 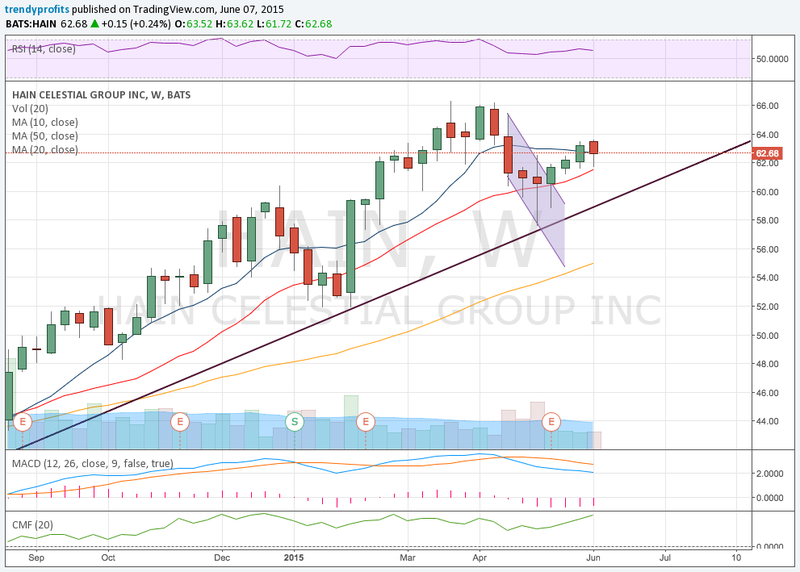 $HAIN – Stock will get bought out at some point. Stores are increasing their organics section. 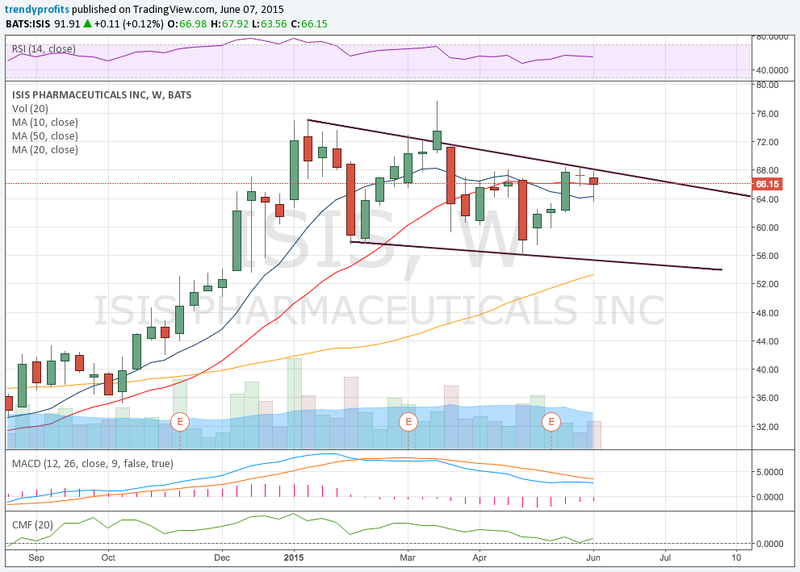 $ISIS – Stock is still consolidating after a long bullish run. Looking for volume and the resistance to become the support. 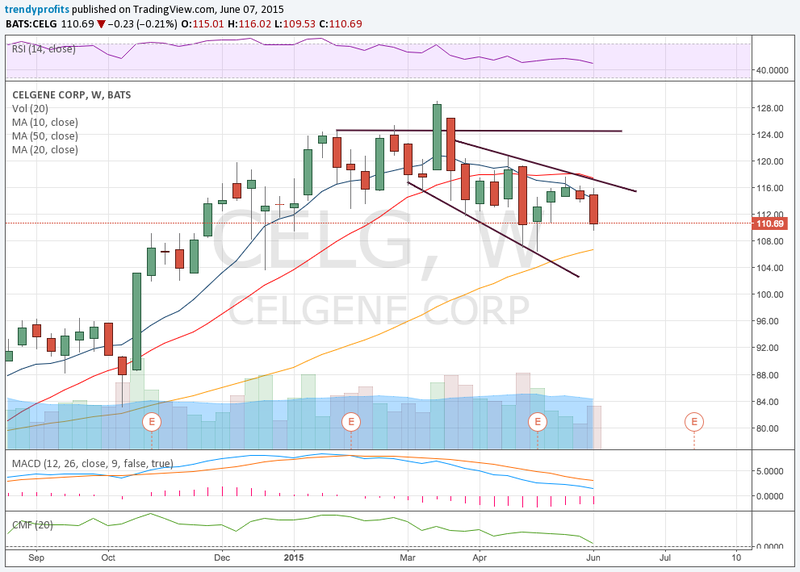 $CELG – In the same situation as $ISIS. Stock is strong with a large pipeline. Look for this to run. 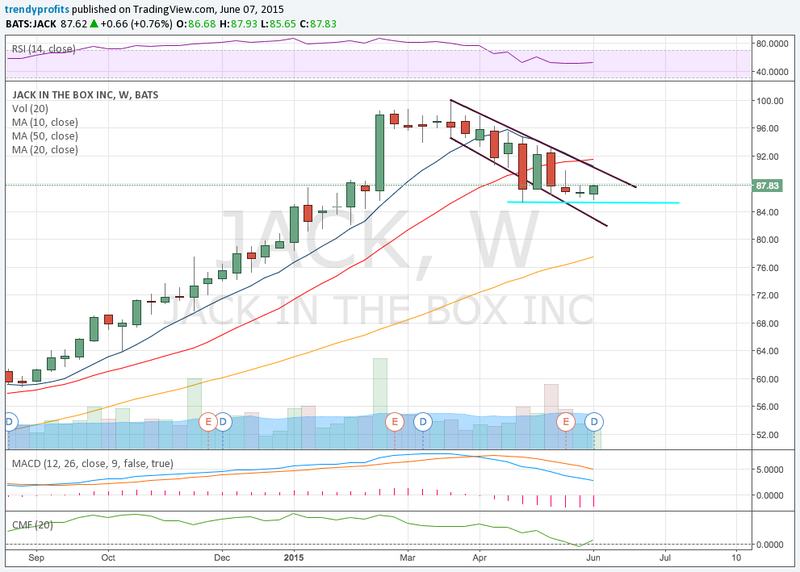 $JACK – Probably the most undervalued stock I am following. Money is flowing into $SHAK, and once that bubble pops, expect the money to flow back into this one. This week saw a pretty big rally in stocks, specifically stocks with companies who do business overseas. Why? 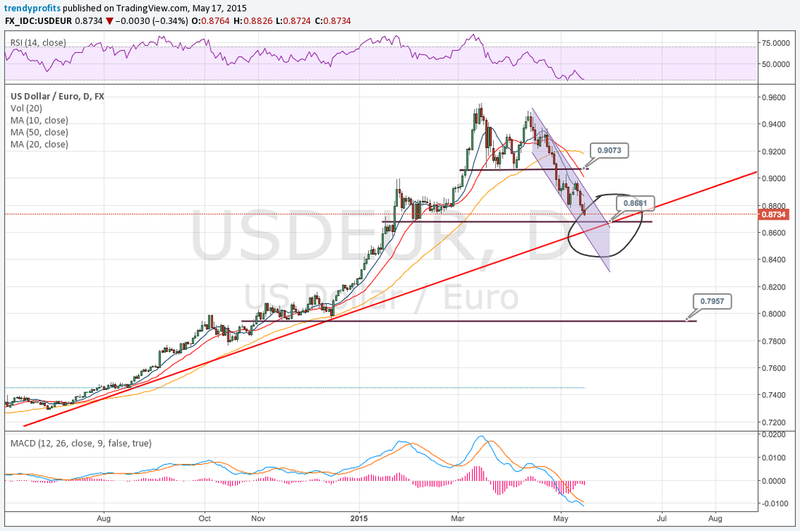 The USD has been on a tear since last year, but has recently faltered. Companies have been crushed this earnings season, blaming the EURO for missing the streets estimates. Many companies guided down Q2 earnings and their full year outlook. Money which was flowing into more domestic stocks since 2015, has started shifting back to globally focused stocks. A few that come to mind are TrendyProfit favorites such as $AAPL, $FB, $NKE, and $SBUX. Going into next week I am looking at a key level of support. When the dollar approached its first horizontal support at .90 it did not even blink. This week it looks like we are approaching the second level of horizontal support and the 8 month support. The key level where these two cross are at .86. If this does not hold I look for a LONG fall down to .79. If this happens, look for more money to flow out of domestic centric focused stocks and into the global players.